I receive so many emails from people asking me how to pray. I decided that this is too important to not write about. The first thing you need to know is there is NO WRONG WAY TO PRAY! The second most important thing you need to know is prayer is simply talking to God. 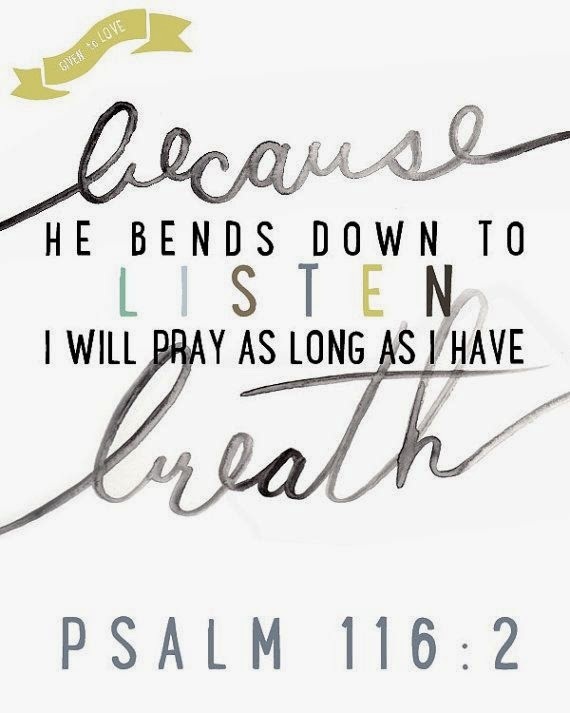 And He promises to hear and listen. EVERY WORD. EVERY TIME. You wouldn't get married and then never speak to your husband. Or never talk to your best friend, right? God wants us to talk to Him. To worship Him. To praise Him. First thing that I always do when I pray and that we should all do - is just praise God for who He is. Just call who He is to you - "God you are Father, you are healer, you are my Saviour, you are my FRIEND, you are my provider, you are my peace, you are the giver of all good things, you are my King of Kings, you are HOLY". Take a minute and reflect on how big and powerful God is and imagine how He is sitting on his throne in Heaven and realize how reverent we should be. But also how approachable and loving HE is and that He LONGS to hear from you. This is the tough one. God already knows our sins. And if we are Christians - He has already forgiven our sins and died for them. But we need to remember that we ARE sinners and it's good to confess them to God and ask Him to help us be more like Him. Thank God for what He has done for you. Thank Him for the blessings in your life or just the small things in your day that you know He helped you with. This should be easy - we all have things we can be thankful for. nothing is too big or small for Him. I try to spend my day in just a spirit of prayer. I pray in the morning in my quiet time and at meals and before bed but I also may pray just driving down the road (I don't shut my eyes. ha!) I may pray as I'm doing dishes. I just talk to God. Don't be intimidated in praying. God DESIRES to spend time with you!!!! Another quick suggestion - my pastor has always given us a plan to help us in our praying. And one thing that really helped me was to designate certain days to pray for certain things. Like Mondays - pray for the schools/teachers, etc. Tuesday - pray for those in government. Wednesday - pray for your extended family. It could be anything but that way you don't feel like you have to pray for everything all in one day. Also - Keep a notebook. Write down your prayer requests - for yourself or for others and date them. Then as they are answered, make note. It's a great way to see God working that you might not realize. And finally - remember God doesn't always answer our prayers the way we want Him to. He answers according to His will and so He will get glory. We may not understand why until we get to Heaven but he sees the big picture and we only see a few pieces of the puzzle. Don't let that ever discourage you from praying. Praying for others and ourselves is a way to grow our faith and trust in God. That's the biggest reason we should pray. A healthy prayer life will change your life.